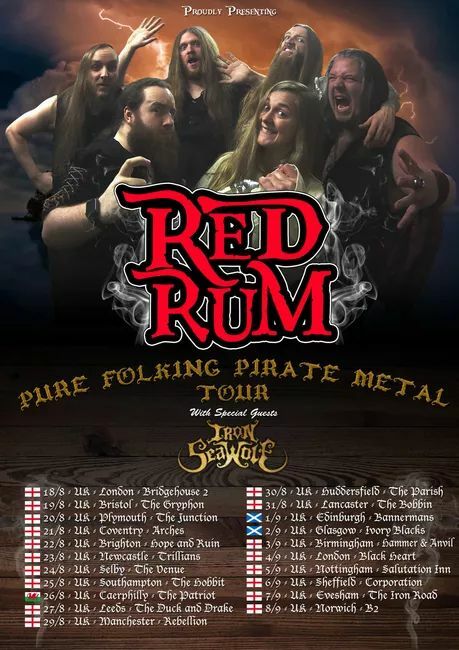 Red Rum, fresh rested from appearances at Bloodstock 2017 and supporting Lagerstein, have just dropped a huge bunch of tour dates for later this year. Support comes from the equally piratical-sounding Iron SeaWolf. Check out the 21-strong list of dates below. Tickets are available for some dates already from the usual sources, or head to the band’s web page for a list of ticket links that will be updated appropriately. Note that the Southampton date is free entry! Nice one Mosh! I’d just like to point out the links to Red Rum’s official site aren’t valid. The correct URL is “redrumuk.com” Cheers. Fixed. I guess that changed a while ago because I just copied our old link from another article!